No Trespassing after Dark Signs are a first line of defense from burglars, vandals, and criminals illegally entering your property. Signs are bold and check any illegal activity on your property or offer warnings for trespassers. • Maintain a level of security on private property by asserting your rules. • Rigid for simple installation on a wall, post or fence. 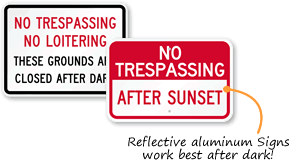 • Reflective signs offer great visibility in the dark. Choose from various grades to suit your area. • Most signs have professional, rounded corners. Sharp corners can cut hands during installation.